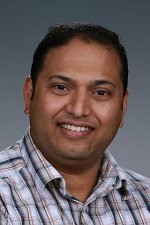 Congratulations to Dr. Gourihar R. Kulkarni who was awarded Phase II funding in the prestigious Department of Energy Small Business Technology Transfer grant. He will work with technology partner Droplet Measurement Technologies to develop an ice nucleation chamber. Phase II funding focuses on the principal R&D effort over a two-year timeframe. "During Phase I, we established the proof of concept for the ice nucleation chamber. Now we've won Phase II funding to actually develop the technology for commercial application," said Kulkarni, atmospheric scientist at Pacific Northwest National Laboratory. "It's a highly competitive program that rewards technology innovation and partnership with small businesses." In the atmosphere, where gaseous vapors and aerosol particles mix, lies the secret of cloud formation that scientists are working to unlock. Current technologies to characterize liquid droplets are well established. Ice particles are a much more complex problem, with five different ways the particles can form. Kulkarni's chamber will characterize one of those mechanisms with this technology grant, which will bring the team closer to unlocking other ice formation mechanisms. The device consists of a computer controller, the brains of the operation, and a refrigeration unit. The advanced cascade refrigeration technique allows the ice chamber temperature to vary from 0 to -50 ° C (about 32 to -58° F).The instrument records temperature, relative humidity (supersaturation), pressure, level of water or ice thickness, the weight of the dry air surrounding the particles, and the size of the ice particles. The instrument can be used in a laboratory or deployed on an aircraft that samples high altitude particles. The resulting calculations measure how many ice particles are formed at a specific level of supersaturation for the deposition method of ice formation, as a function of temperature. The ice nucleation efficiency data is further used to develop, modify, and constrain representations of ice nucleation that are used in climate models. The ice nucleation chamber is something close to Kulkarni's heart. He's worked on the concept since the days of his postdoc. Kulkarni developed the prototype at PNNL for Phase I. Droplet Measurement Technologies is the perfect small business partner, interested in the development of the chamber as a natural extension of their current instruments for cloud condensation nucleation chambers. Kulkarni sees the possibility of someday developing an instrument that will combine all five mechanisms of ice formation into one lab instrument that is portable and extensible. "I have mapped 10 to 15 years of research and development in this technology. It's exciting to be on the frontier of developing ice chamber technologies," said Kulkarni.